With the previous post on the MilValChal efforts and the Startup Day offer, we talked about doing one build, measure, learn loop. The Startup Day offer was an example of that: Make a hypothesis, run a test, and learn. I have personally told hundreds... perhaps close to a thousand people about the startup day offer. And that does not include the 10K people downsteam in my social media.... And yet, we have very very very few takers. I have done this at Startup weekends that I was facilitating, at the Open Coffee meetings, as the Key note speaker at a Startup day conference with over 600 people in the audience, In the Lean Startup Seattle meetings. Do a BML loop and you will get $$$. The strange thing is that this Lean Startup experimentation is exactly what startups should be doing. Fast, timeboxed experiments that lead to understanding of the market. One of the thoughts is that our process was not as clear as it should be. This is likely a distraction and that we should take the data at face value. We made an offer, our conversion rate was very very low, so we have not yet found customer/problem fit. We have in fact had one of the Open Coffee participants run an experiment and collect the $$$ from Adam. But the handful who completed it vs the thousands that were aware of it.... Relatively high customer acquisition cost. Adam Berk (@adamberk) has outlined the next round of the experiment. There is room for 20 people to can get this. Between now and the end of March, if you follow this set of instructions, you can collect $500. Test the hypothesis. That is, go talk to target customers, make them an offer that tests the question at hand, take something of value in exchange (money, time, space), and then deliver on the offer. PARAGRAPH 1.5 (Copy and paste the following = I am part of an experimental incubator that gives startups and entrepreneurs funding in exchange for testing and sharing leanstartup hypotheses). PARAGRAPH 3 COMMENTARY - take the MOST SURPRISING or MOST WRONG metric - and explain why you BELIEVE this happened... this can be positive or negative. Maybe 90% of 1000 people did something, THAT'S GOOD... but really it's bad because of how far off you were. Before you try and scale, you need to know WHY. Maybe only 1% converted, maybe you only got 50 views... pick apart ONE SINGLE VARIABLE THAT WAS MOST WRONG. PARAGRAPH 4 BONUS COMMENTARY explain the rest of the variables... If your last experiment had negative results... restate your problem and customer statements here. Run the test to see what really happens. We like Data Driven Startups. If you go through your whole Lean Canvas and associated business assumption, you will be able to learn quickly and to find a business in the midst of all the data. However, we see that entrepreneurs tend to lean into their assumptions and try to start building and then selling the solution that they have not tested and validated with the market. That is, they don't actually have meaningful Lean Customer Development conversations with real customers. If they do talk to customers, they are either "themselves" as the customer, or they are so informal in the process, that they actually don't get good data about what people are actually willing to do. As outlined in the previous post, Just one Lean Experiment ( http://www.oomaat.com/2016/10/just-one-lean-experiment-to-progress-to.html ) , Liberty Ventures and Adam Berk (@adamberk) is offering $1000 for one Lean Experiment , which goes through the whole Build-Measure-Learn Loop and then documents it in a post. As a special opportunity for my Estonian trip and the Startup Day in Tartu, Adam has agreed to do a specific offer again. There has been $5000 set aside for up to 5 teams that choose to commit to, complete and then document only one Build-Measure-Loop. If you do this, loop, which should take a week or so, then you will get $1000. There is $5000 set aside. So the first 5 to complete it will get paid. As you are getting ready to pitch your startup, there are some good things to remember. First, you are going to need several pitch formats. A 30 second pitch (elevator pitch) , a 1 minute pitch, a 3 minute pitch, a 5 minute pitch, a 10 minute pitch. These are not the same pitch slower. They are different pitches aimed at getting a specific thing to happen. That is, they are pitches in different contexts. And they all have the same overall task as a goal: To get to the next meeting. Additionally, they all have the same foundation at the core. When you work on your Lean Canvas, you are working to illuminate that core business model. Let’s take a look at how that might work. our (PRODUCT NAME) is ____________ (PRODUCT CATEGORY). Unlike existing alternatives, _______ (EXISTING ALTERNATIVE #1), _______ (EXISTING ALTERNATIVE #2), and _______ (EXISTING ALTERNATIVE #3), we provide __________ (FEATURE #1) that _____________(UNIQUE VALUE PROPOSITION). We see that _________(CUSTOMER ) are spending __________(REVENUE - Market Size) to solve __________(PROBLEM). This provides a little more detail on the company and how it fits into the market place. However, there are two things that are missing: A request at the end and an attention getting mechanism at the front. Where we have clarity in the business model, the task of pulling together an appropriate and effective pitch becomes much easier. Because you will be connecting with Investors multiple times as you engage in the process of seeking investment, it is always good to have a way to mix up the story a bit as well. Saying the same pitch over and over again, without updating and evolving it ends up being a signal to investors that you are not learning along the way. So please expect to be reworking and revising the various pieces of your pitch along the way. Hopefully, this will help you create a specific framework that gets you started on an effective pathway to doing a good pitch. Practice this pitch process every day, with different people, and learn how it evolves and how to make it more effective. The key is to be remarkable. That is, to have other people talking about you after you have left. Typical early stage pitch sessions have a dozen or more companies presenting at the same time. Just given Human short term memory structures, only 3 or 4 of the companies presenting will be remembered. What will you do to be remarkable enough to not only be remembered, but to have the investors telling your story for you? Everyone on your team should understand your core business model and be able to give a pitch at a moments notice. In a startup, everyone is a sales person. I regularly get people contacting me to talk about their startup and the work they are doing. Frequently they are very very busy doing startup-y things like managing their team, organizing their tasks, raising money... But strangely, not really doing any significant Customer Development. 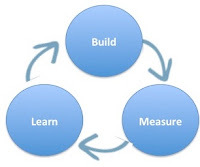 I have run several experiments now where I have made them an offer to take a small time-out, and to run a Lean Startup Experiment to do just one Build-Measure-Learn loop in a formal and transparent way. My experience is that there is serious significant resistance among entrepreneurs to really talk to real customers. As a person who believes deeply in the Lean Startup methodology, I would start the conversation urging you to stop building your prototype. Clear the space for you to do significant customer engagement. The Lean Startup idea is that you put Customer Development before Product Development. That is you talk to , understand and adapt to a customer base, discovering and validating your customers before you build things. These are in order. Chances are, you do not have technical risk. You need to find 100 customers who really really really want to pay you now to solve a problem; before you take one more step on building the product, find those 100 people. Scaling Lean by Ash Maurya. And I recommend that you get the Startup Owners Manual by Steve Blank, and strive to read one page a day. Keep reading pages one at a time until they start falling into place. This would allow you to get focus on this Customer Development before Product Development. Remember in the Theory of OOMAAT, your first step is to find just one customer. Don't think about anything more than things that lead you to your first paying customer. Then we can worry about how we might get to ten paying customers. Standups every 90 minutes at a Startup Weekend? Why? Tonight, I am facilitating another Startup Weekend. It will be my 55th startup weekend event. When I do a startup weekend, I try to engage the group in regular standup status meetings every 90 minutes. And I am sure that the Technical coders in the room feel somewhat unhappy about all the interruptions. So.... Why would I want to continue this practice? It is frequent that teams hole up and never get to see others. By having to stand together, they at least get to see other people and to engage with them. All 100+ people stand up and circle up to do the standups. When they work right, 13 teams can be done in 8 minutes. When teams report out things that the other teams have not thought of, often they are able to get those things one the task list and going much much faster. It is frequent that people have big fuzzy ideas and have not figured out how to drive them down to small manageable tasks. By breaking things into very small sprints, we are able to get people to focus on things that move the ball forward faster. Instead of being lost in the midst of a fuzzy swamp of ill-formed ideas. When people get up, move, push the blood around, they come back a bit more energized and a bit more focused. Without these breaks, people tend to get a bit fuzzy headed. A weekend is a long sprint without breaks. By actually physically seeing everyone together, it creates many more relationships over the weekend, than when people are only talking the whole weekend to their 6 team members. By having the team leaders report out, we help them be better known in the community and help them reenforce their role on the team. If every task you are doing has to be small. Think Pomodoro (25 minute tasks), then the need to do something now gets stronger. The whole "No Talk, All Action" motto is focused at this idea of doing instead of discussion. If you can't decide in 5 minutes, flip a coin. If you can't get the task done in 25 minutes, break it up into smaller pieces. With Pomodoro (25 minute sprints) and a team of 8 people, with 20 hours of real working time, you should be able to get 8 * 40 = 320 tasks in the weekend. For many this is more progress than most people make in a month. If all of you tests are designed to be answered in 90 minutes, you will learn much much quicker than if your tests are designed to be answered in a day. By using the Build-Measure-learn process with very quick iterations, you make much faster learning. Most people have habits that make it hard for them to make rapid progress. By doing standups, we drive some of those habits away , at least for a weekend. This weekend, I will experiment with using Slack + Trello as a tool and see if this helps any of these areas. Perhaps there are some ways to get people to be more effective with less interruption. However, moving your body and meeting other people are in some cases more important that staying in the current task that is taking way way too long to be effective. @adamberk put together the MilValChal to explore a process to engage more deeply in running customer development tests. The goal is to help people make more effective progress towards doing a complete experiment cycle, with the belief that transparent experimentation will lead to value creation at a higher ROI than not. We have been having a conversation about how to help people focus on the basics of doing explicit experiments. So very often people skim through the experiment effort jumping directly to the conclusions they already had in mind. In our discussion about how to move people forward, we discussed doing a single full experiment. We want to bring the MilValChal vision together. So we want to experiment with having people do one complete experiment. To bring people full circle through one complete experiment, @adamberk has $25K to help 25 companies make focused progress to complete a Lean Experiment. He will pay out $100 to as many people as fill out the first half of the Experiment Report Board (left side) within a week of this post being published and $900 to anyone (of those people who enter the funnel in the first week) who fills out the second half and writes a medium post sharing their learnings and next steps based specifically on those learnings. In the BODY of the email write = “I believe that 15 submitted Interviews will prove that out of of <$Y> who are will take by November 1st, 2016. If there is an experiment proving each of these milestones, the chances of your startup having a good foundation are greatly improved. This pathway starts by doing one experiment. Will it help you to do a complete experiment to start with this $1000 challenge? When you are starting a company, the week by week growth rate is important to track. Initially, it will be very chaotic. Hopefully, early on, you will find a way to make your revenue process predictable. 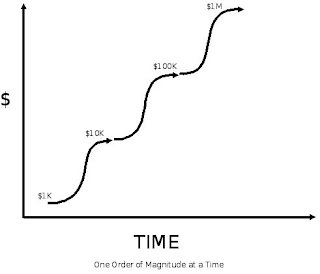 Investors are looking for evidence of this predictability. They are also looking for something else. They are looking for evidence of growth. When they are thinking about growth in revenues, they are looking for a percentage growth on a week by week basis. More data points can help you get a handle on the foundations of your business model. Looking at the curve above. This company starts with $1000 Monthly Recurring Revenue (MRR). The blue line represents an initial growth rate of $100/month, which is 10% growth in the first month. The Orange line represents a Monthly growth rate of 10% a month, month over month. While the Red line represents a 5% month over month growth. All of these start out at the same point, but the 10% month over month growth quickly outstrips the linear growth. At the end of 3 years (36 months) , the 10% growth represents a 5X increase compared to the 5% growth curve. More interestingly, while the linear growth started at 10%, by month thirty, it has crossed over and is the same as the 5% curve. 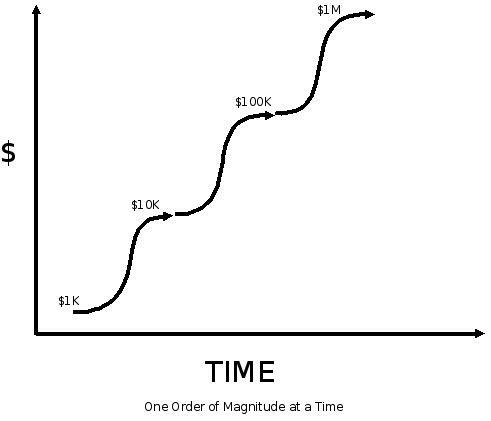 When you are looking at your growth oriented startup, you should be looking at at least kind of exponential growth. That is growing at a regular X% growth month over month. If you have a 10% month over month growth, your company is approximately a 3X company. If you have 20% month over month growth, then your company is a 9X company. If you are aiming at a 10X company, you need to reach 22% month over month growth on a sustained basis.